In stark contrast to the materials I used in the Vermont Mini-Cabin, much of the structure of the Park City Modern house is engineered lumber. The entire floor system is framed from “I-Joists,” or “TJIs” as they are called informally. (The I-Joist was pioneered by the brand TrusJoist Inc., thus the acronym TJI, I think.) The brand is now called iLevel, and is a division of Weyerhauser. Other companies make similar product. The main floor system with the TJIs in place is shown in this photo. 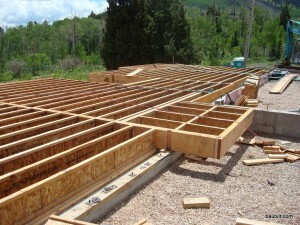 Main floor system framed with I-Joists (TJIs).